ewo creates high-quality lighting systems for public spaces. At the main facility of this family-run business, headquartered in South Tyrol, products are developed which bring light to a variety of different settings: streets, squares and buildings; walking trails, urban gathering points and airports. A modular LED unit forms the basis for our sustainable and energy-saving lighting scenarios, irrespective of scale. The company’s progressive technology, differentiated know-how and creative openness has made it a trendsetter for the sector. Even in the most challenging of settings, ewo provides custom-tailored solutions for distributing, limiting and controlling light – solutions that have become a quality feature in the design of public spaces. Flora Kröss and Ernst Wohlgemuth founded ewo in 1996, developing it out of a metal factory in Sarnthein/Sarentino. Hannes Wohlgemuth took over the role of company Chief Executive January 2019 (see press release here). 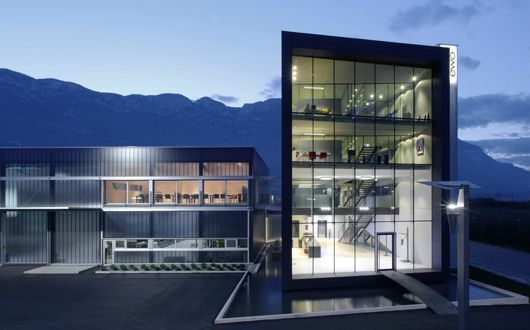 Headquarters: Kurtatsch/Cortaccia in the Bolzano area, South Tyrol (Italy); offices in Austria and Germany; other European and international partners.